In every box that FreshFiction sends, there are three main elements. First, there’s books (duh), second, there’s a wee note from the author of the featured book to give us some insight, and third, there’s a bag of tea. As someone who believes all the best reading takes places with beverages – the tea is one of my favorite bits. In this box, there are zero authors I’ve ever read before. Don’t you love that specific hope that comes from learning about new authors? It’s like a moment of untapped possibility of meeting new friends. And y’all, I read hundreds of books a year so for me to find romance publications of authors I’ve never even heard of is rare. This box, therefore, is a treat. I haven’t had a chance to read any from this box yet – just unboxed it myself! – but check back throughout the month here on Beverages and Books as I review the ones that came in this month. I’m particularly excited about Something Like Happy by Eva Woods, which sounds like a delightful tale of self-discovery and friendship – one of my particular booknips. Wanna explore this for yourself? 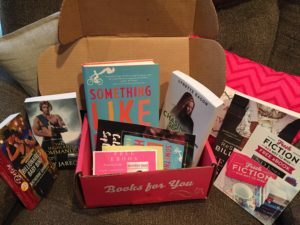 Check out Fresh Fiction Box here. Full disclosure, I received this box from FreshFiction in exchange for this review.